Last weekend we were at the ACE event. Next to the introduction of the ACE geocacher, the ACE event coin, we also had a small celibration with the introduction Venetian Mask Geocoin. A beautiful coin in a special dutch edition. There are a few coins left which are available on our website as of now. This week we also have a new FarmtagZ trackable: the Belgium draft horse. We now also have a special offer with all 4 FarmtagZ models together. This is the Mardigrass-Multi-Event coin. On many places over the world, events have been held to celibrate Mardigrass. This is the Dutch edition. Orange, blue and black coloring with an orange backside. This coin is limited to 100 pieces. This coin is influenced by the area from Cape Breton, Nova Scotia ('New Scotland') where there is a huge Scotch/Irish influence. It contains celtic knotwork. The text on the front reads 'True and Eternal' and on the back is the word 'love'. This geocoin was invented by Tekkguy. The All Seeing Eye. There are different versions of this geocoin, but now we have the nickel / blue version. This Cache Angel Geocoin has a beautiful 3D relief on the front. It is an Angel knieling through his sword piercing the ammo can. At the back of the coin "For Those About To Cache" and a keltich sign. The inspiration for this coin comes from the glorious Middle- and New Kingdoms of Ancient Egypt. Lotus buds and flowers (Nymphaea caerulea), symbols of creation & rebirth, are used to create a compass rose around the central disk of the sun. On the reverse, the classic representation of Aten (the sun disk, represented in the way of the artisans of the Amarna period) with hands finding an Ammobox. This coin was initially released in five versions: Aten, Set, Osiris, Nepthys and Anubis, but later they have desided to make this special Black Nickel version Duat. Size: 50mm in diameter, 5mm thick! FarmtagZ are dogtag-kind of trackables, based on the animals in and around the farmhouse. New in the FarmtagZ series is the Belgium draft horse. The FarmtagZ are appr. 5 cm. 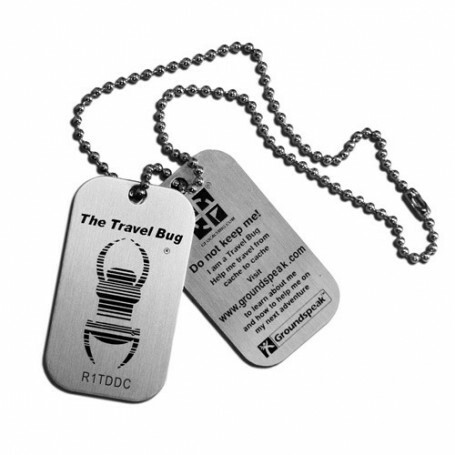 Trackable at geocaching.com with its own icon: . Now a complete set of all 4 FarmtagZ: the cow, chicken, goat and the Belgium draft horse. All FarmtagZ are appr. 5 cm. Keep peace moving. Peace represents healthy relationships, safety, good welfare, respect, and freedom from civil disorder. It is large enough to be seen, but sized just right to fit in a 35mm cointainer. You also can attach your favourite item to it.